We love our pets, and love showing them off too! Our Custom Paw Products are handmade with your pet's actual paw print embedded into the jewelry or gift. By following our three-step custom 'paw-cess' (as seen below), you can get started on creating your own unique piece to show off your best furfriend(s)! 1. 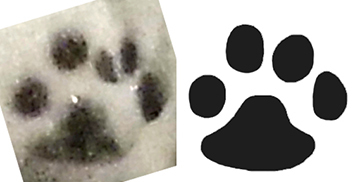 Send us an email or text with the paw print image, or upload it during checkout. Be sure to save the file with the pet's name or order # so we can easily track it! 2. Within one business day, we will email you a rough draft of the paw print to approve. 3. Once approved by you, we will start the process of creating your custom paw piece! How do I send my paw print? Please email, text or upload a photo of your pet's paw. We also accept photos of ink prints, molds, and even snow/mud tracks! Our contact information to send the prints can be found on our Contact Us page. How long will it take to receive my draft? You should receive a draft of the print within the next business day after the paw print photo is submitted. Can I send my paw print prior to placing an order? Of course. There is no obligation to place an order for us to do a rough draft! If you like the draft - awesome! When you are ready we can get started with a custom piece. What does it cost to do the draft? NOTHING! We will create the draft for free and no obligation to make a purchase. We don't start the order until after you give us the green light by approving the draft. What is the time frame to receive my order? After the draft is approved, it normally takes 7-10 business days to create your custom piece. What if I'm ordering a gift? Please mention that the item will be a gift during checkout - there will be an option in the shopping cart. 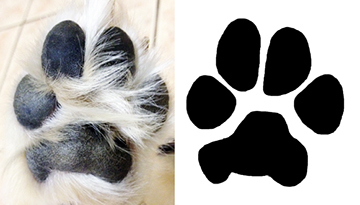 We will send you (the purchaser) the initial paw draft for approval. Can I use more than one paw print? Yes! Please send an email to ksmith@4pawsforever.org with your request and the product you wish to create. We will design a special draft for you to approve with the additional paws. Do you create custom paws for animals other than cats and dogs? We are able to create a custom piece for any type of animal and human print! Feel free to send along the image prior to your order if you would like to preview the final draft.